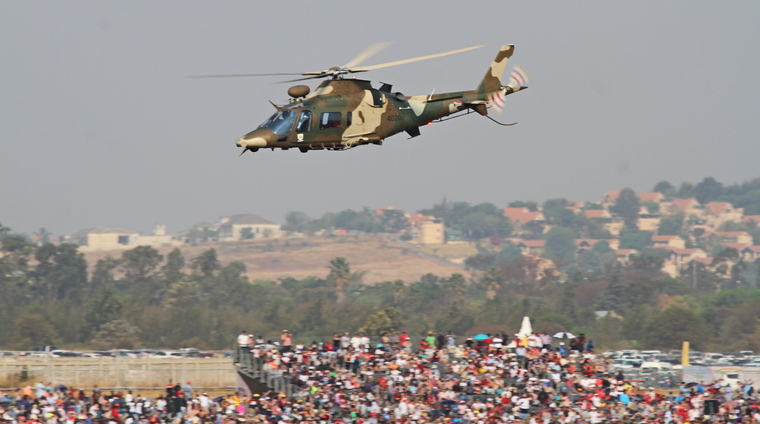 AAD, the biannual Africa Aerospace and Defence Exhibition held at AFB Waterkloof in Tswane, Gauteng traditionally ends with two air shows held on the Saturday and Sunday that are open to the public. The air shows, that are without a doubt the highlight on the aviation calendar follows three trade days that are closed to the public. Because of publication deadlines we were only able to attend the Saturday show. The Sunday show in any case is more or less just a repeat. 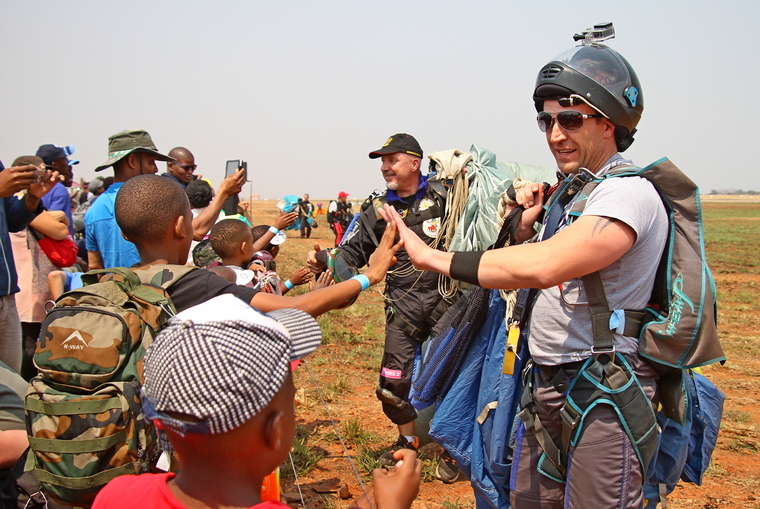 The packed program that featured most of the SAAF's assets as well as almost all the SAAF Museum's airworthy aircraft drew thousands to the base. 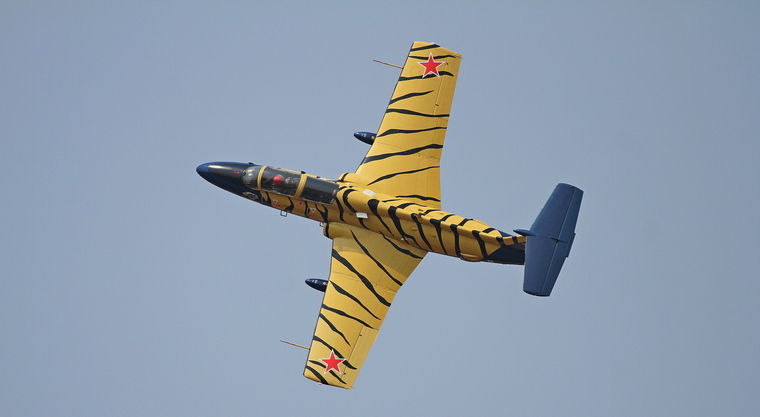 Absent this year were most of the top civilian aerobatic display pilots who were involved in shows in China. 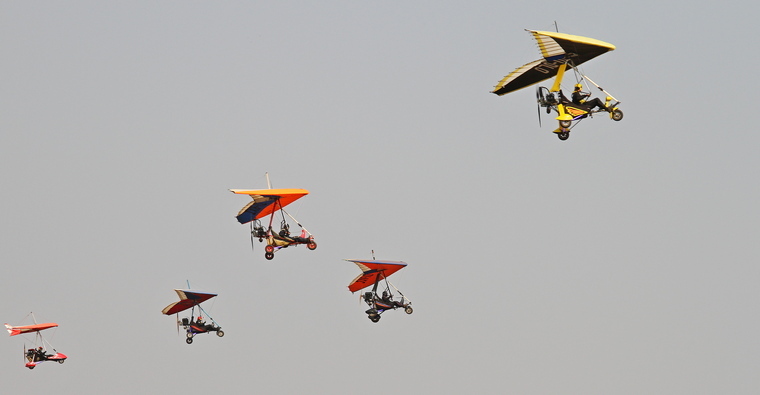 The appearance of the Weighshifts during the show was a first for AAD. 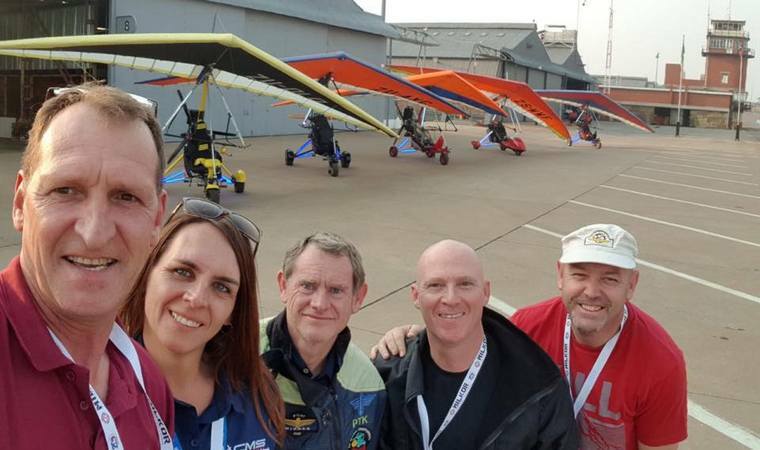 Marius Nel, Adrienne Visser and some of the other pilots. Photo by Marius Nel. 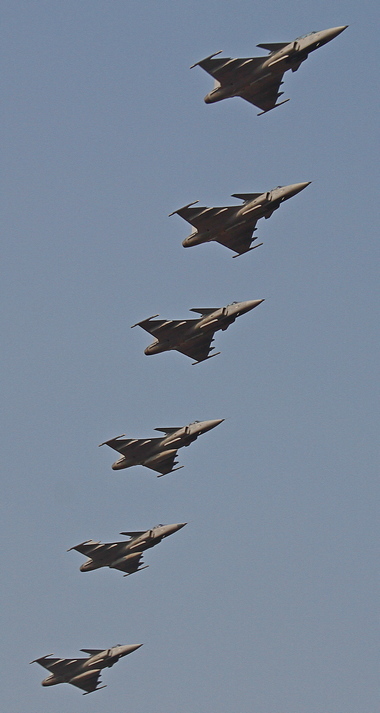 The Bathawk formation formed part of the Proudly South African display during which a number of locally designed and produced aircraft were displayed. So did Paramount's ARHLAC that has now gone into production for an unknown buyer. 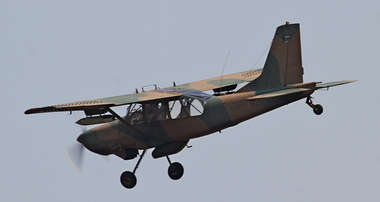 The ARHLAC is almost marketed and scheduled for production in the USA as the Bronco II. 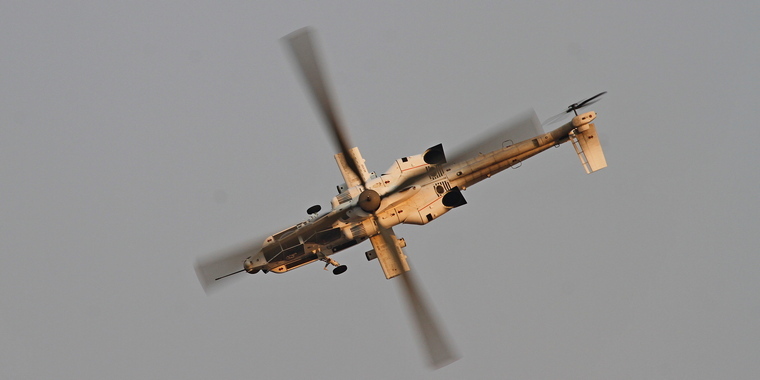 A number of civilian acts more than filled the gap left by those pilots that are currently abroad. Neville Ferreira and Andrew Blackwood Murray did a two ship display after which they broke away for solo displays. Neville, who has thrilled the crowds in Europe in the Genpro later did the same in his Slick 540 to the more than 50, 000 that had packed AFB Waterkloof. Ivan vd Schaar in the Boeing Stearman and Jon-Marc Hill with Juba Joubert as safety pilot performed together in their iconic biplanes. They later also did solo displays and almost caused a riot when they dropped marshmellows along the crowd line. The Tailifts Cows in the legendary Pitts Special are an essential part of any show. They did not disappoint at AAD 2018. The Puma Energy Flying Lions performed twice on the day, one of which was their spectacular dusk show. 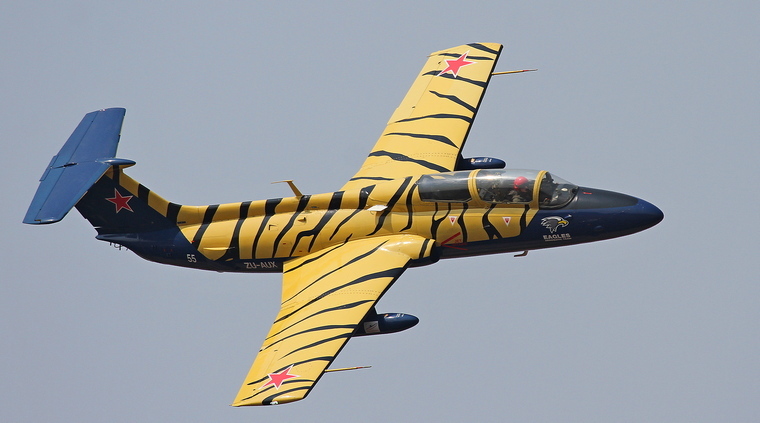 The last of the civilian acts was a high-speed performance by the L-29. 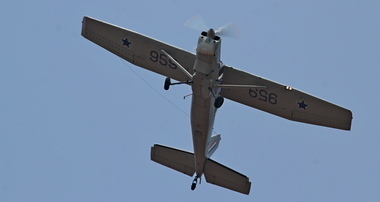 The SAAF Museum played a major role during Saturday's show. The Museum, that holds a practise day every first Saturday of the month when members of the public are welcome, operates with very little support from the SAAF has however managed to keep a respectable fleet of aircraft flying. 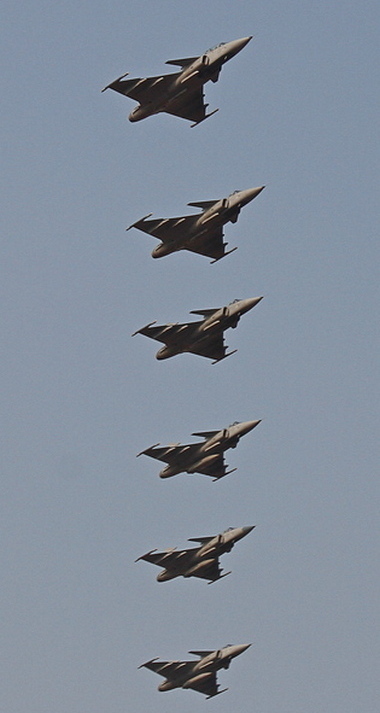 The SAAF started the day with a formation flypast of four Gripens and three Hawks and although only one Rooivalk was present it none the less made up for it by some spectacular flying. 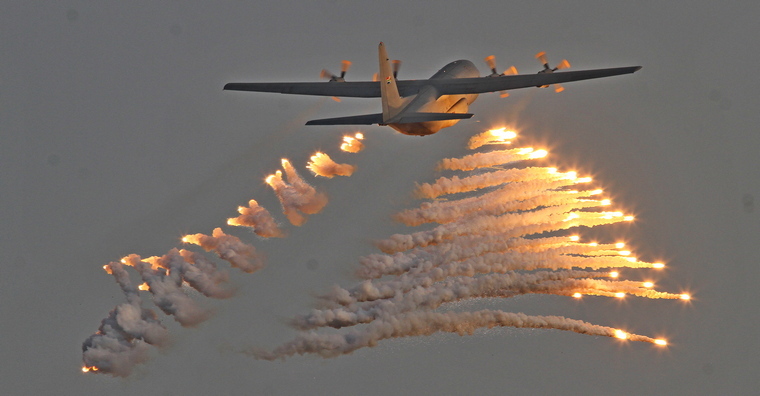 AAD is essentially a military show and the SAAF pulled out all the stops on Saturday. The Silver Falcons, the Ambassador's of the SAAF are an essential part of any show. 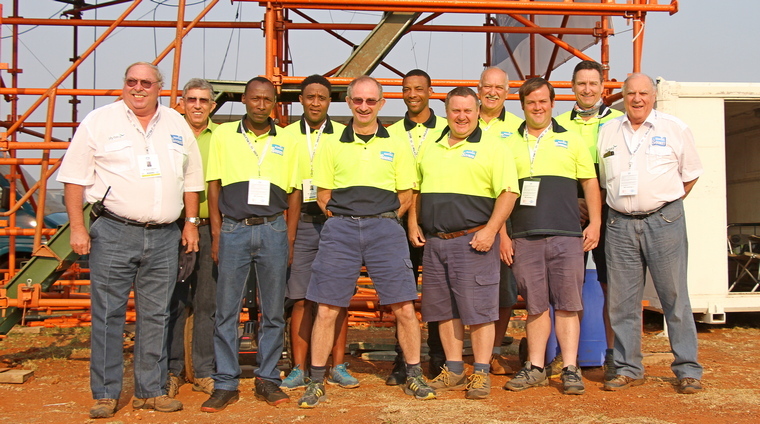 Team 82 that took part at AAD 2018 and consisted of Falcon one Maj. Omphile Mutloane, Falcon two Maj. Tiaan Stander, Falcon three Maj. Corne van Deventer, Falcon four Bheki Shabangu and Falcon five Maj. Sivuyile Tangana. Skydivers are probably the most anticipated acts especially by youngsters at any show. Landing close to the crowds they always interact with the children who flock to the fence to touch hands. 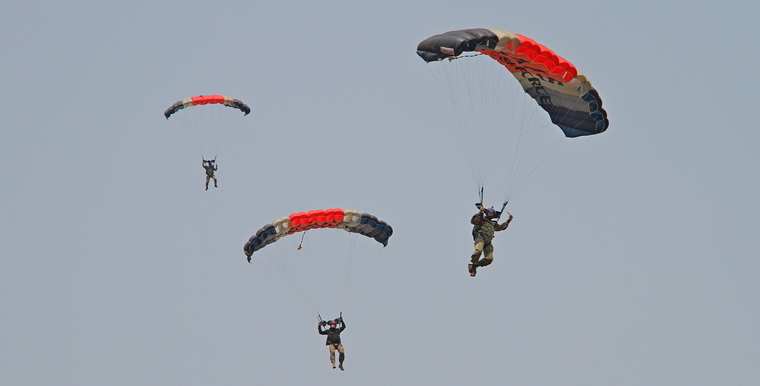 Three loads of almost forty each were dropped on Saturday. A mass radial flypast consisting of Harvards of the Puma Energy Flying Lions, The SAAF Museum and the Harvard Club of SA filled one of the allocated spots. 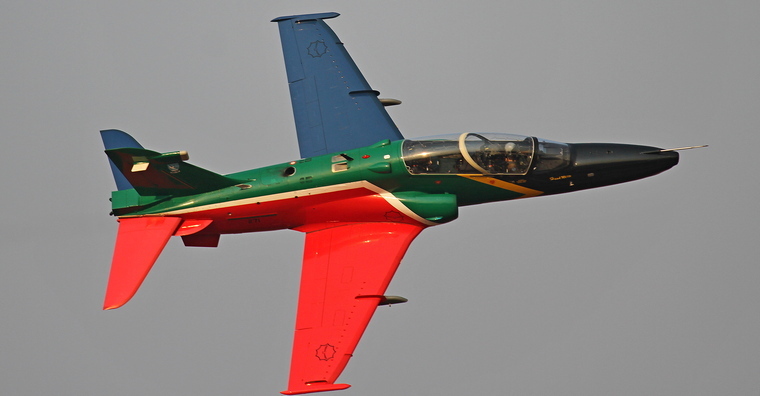 The only foreign country to display a military aircraft during the airshow at AAD was the K-4 of the Zimbabwe Air Force. Filled with action, noise and high powered aircraft AAD 2018 was again a good show, easily on par with any from abroad that we have attended. Col Keith Fryer and his crew must be proud of what they have achieved. 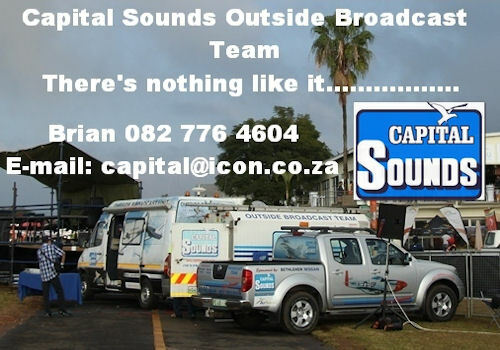 Capital Sounds brought its full crew and during the day made extensive use of speciality commentators. By day's end in our estimation more than 50,000 people attended the show, a large number of which stayed until the very end.